Do you want to know your home's current value? Are you looking for a home market evaluation? Are you getting ready to place your home or condominium on the market in Southern New Hampshire. Then you need to have a well implemented pricing strategy. It’s very important to have your property strategically priced in a way that will make it stand out from the competition. Having a price evaluation report completed on your home is complimentary and there is no obligation on your part. Coldwell Banker | Dinsmore Associates has been successfully pricing homes to sell in southern NH since 1978. We have the experience and skill to make sure that the price of your home is market sensitive while at the same time makes sure you will be getting the top dollar for your home. 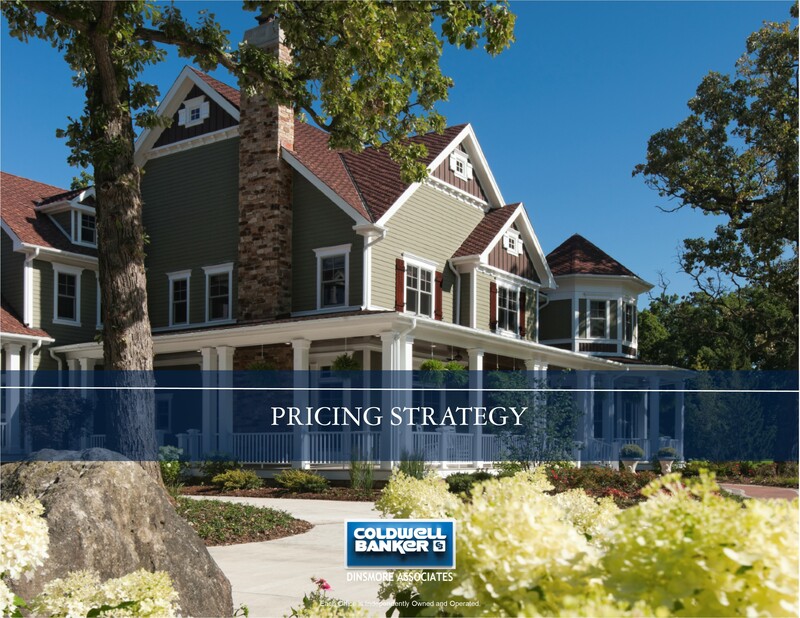 Developing an effective pricing strategy for your home in southern NH is the most important step to insuring that your home sells for the highest price possible in a reasonable amount of time. Having a home market report prepared by a sales-professional from Coldwell Banker | Dinsmore Associates, is the best way to insure your home will be competitively priced in today’s real estate market. The correct selling price of a home is the highest price that the market will bear. The market approach is based on the premise that a prudent, informed person will pay no more for a home than it would cost to purchase a comparable substitute. To determine the correct asking price, we have provided you with a comprehensive market analysis of comparable properties that have been recently offered for sale in your community. This analysis is based strictly on homes that can be considered similar to yours, and has been especially prepared for your property. Similar properties that are currently listed (the competition). Similar properties that are currently pending. By carefully studying the comparable property locations, features and terms under which they were offered, we can develop a clear picture of the potential market for your property. By looking at the properties currently listed, we can see exactly what alternatives a serious buyer has to choose from. We can be certain we are not under pricing the property. By looking at similar properties recently sold, we can see what homeowners have actually received over the last few months. This is the acid test used by lending institutions to determine how much they will be willing to lend a buyer for your home. By looking a pending property, the most recent sales, we can look for possible pricing trends either upward or downward. It will take coordinated teamwork between you and your real estate broker to sell your home. Selling your home for the highest possible price in the least amount of time requires teamwork. Your team consists of your real estate office with its other sales associates and management, your individual listing associate, and yourselves. Coordinated efforts by all of the parties are necessary to bring about a sale of your property. The terms of the sale. Preparing the property for showing. Making the home available for showing. Preparing a marketing plan and marketing materials. Placing your home on the internet. National connections that provide buyer relocation leads. An outstanding past performance record. The personal referral networks of our experienced top producing agents. Making the property available to other agents through M.L.S. Advice in negotiating offers to purchase. These are the factors outside of your broker’s control as well as yours. Current market conditions caused by local or national economic trends. Interest rates and the availability of financing. With a concerted team effort we will sell your home for the best price in the least amount of time possible. New listings generate a lot of excitement. Real estate agents and potential buyers are both searching for what is new and exciting on the market. Your home will generate the most activity when it first debuts. This is why it is very important that your home is priced right and shows great the day you open the door to potential buyers. The best offers often come when a property is newly listed—if priced to high, it’s difficult to generate the momentum needed to bring about a sale. If agents and buyers are turned off by too high an asking price or poor condition they probably won’t take the time to take a second look when you finally reduce the price or make needed repairs. Why not use the convenient contact form to begin the process today.